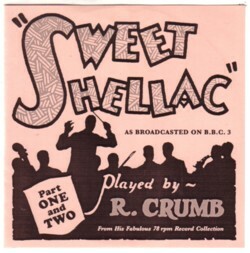 Fake Booy gave me two CD’s with four radio programs on it that Robert Crumb did for the BBC 4, called Sweet shellack . I just did a quick search, but it seems that these programs are never officially released on CD. (Please correct me if I’m wrong.) All I found with Google are links to Torrents of this material. Or more of this material, because in the first show on my CD’s. Robert Crumb mentions that he got many letters after earlier programs. Maybe there is more Sweet shellack than the four episodes that I have! 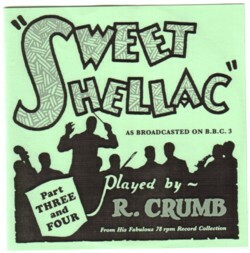 I have no idea how many tapes, records, CD’s and mp3’s are made with recordings from Robert Crumb’s 78 record collection, but I wouldn’t mind having all of it. He has great taste, and his knowledge is exactly the kind of info that opens up my ears to this music. Especially the shows about French jazz before Django Reinhard and Black American string bands are great. I wouldn’t have minded if they lasted three hours in stead of half an hour. The BBC 4 programs are very well made, as usually. It is better to download one of the Torrents yourself, if you are interested in this material, but here is the opening of the first show, to give you an idea of Sweet shellack .